Although I've worn makeup regularly since I was about 18, before I started blogging I was very much a use one of each type of product girl and then I would just replace it when it ran out. This has obviously changed since I started blogging a year ago and now I have several of each type of product that I use. Even though I have more products and shades to chose from now there are some that I reach for more than others or that I just really enjoy using in general. 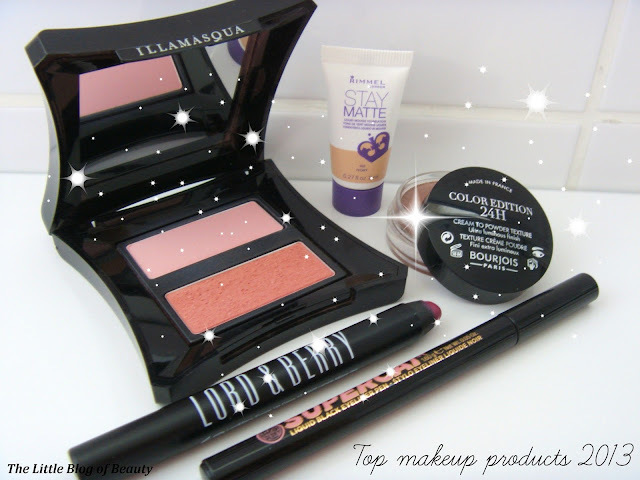 So here are my top makeup products for 2013. Earlier this year I popped along to the Illamasqua counter in Meadowhall in Sheffield for a blusher master class. When I got there I was told that for whatever reason the master class had been cancelled but I was offered a makeover instead. I wasn't necessarily planning to make a purchase (I believe the master class cost £20, which could be redeemed against products) but during the makeover I suddenly panicked that they may still be expecting me to pay to cover the cost of the makeover. Not wanting to ask I decided to just purchase a product and decided on the blusher duo containing Katie and Ambition. Although I hadn't planned to get this I'm glad I did as it has become the blusher I reach for most often. I believe you're supposed to use Katie (the candy pink shade) as a blusher and Ambition (the neutral shade) to contour. However I'm completely useless at contouring and actually really like Ambition as a blusher shade on my skin tone so I just use whichever shade I fancy that day as a blush. This is a sample size product I found in a Company/Cosmo goody bag from the Clothes Show. I was really pleased to see this in there as I'd been considering giving this a try but was a little unsure. I won't say too much about this here, as I intend to blog about it after I've picked up a full size version, but it's safe to say that despite being unsure about trying this I now love it! I haven't got round to blogging about these yet but a review will be following (hopefully) in the very near future. I bought Petale de glace about a month ago with a couple of other products and got the free gift that Bourjois were offering at the time. After discovering there was a voucher inside the free gift for £2 off any eye shadow product I went back and bought Merveille d'argent. I never wear eye shadow, but my new years resolution is to start wearing eye shadow regularly, and I can see these becoming the one's I reach for daily. My review for this lipstick crayon has been one of my most popular posts. I just love this this lip crayon! It's the perfect autumn/winter shade for me, it smells amazing, applies like a dream and lasts well. I don't think there's anything I don't like about this product and I can't wait to pick up a couple more shades in the future. I've always been shockingly bad at applying eye liner. Over the years I've practised and although I still can't apply it perfectly in one quick, fluid swipe I have got better and can sometimes just about get it to look presentable enough to go out in public! Although the Supercat liner does have some mixed reviews, the good reviews and the reasonable price convinced me to give it a try and I'm glad I did. This just seems to make applying my eye liner so easy and I've now started wearing it regularly using this (and going out in public!). So these are my top 5 makeup products of 2013. Have any of your favourite makeup products made it into my top 5? These all sound gorgeous! ANd I haven't tried any of them so I need to rectify that. I'm really intrigued by the RImmel foundation. I'm usually a high end foundation girl but I keep seeing that pop up as a favorite. The Illamasqua blush duo is so beautiful! The Rimmel foundation is awesome, I had a tester of it too and ti looks amazing on your skin...sooo smooth and not cakey! I love it! Great post lovely, I enjoy reading these kinds of posts! I need to try the Stay Matte foundation, I remember using it years ago and it was awful but they've obviously completely reformulated and repackaged it because I've heard nothing but raves about it now! Love the Soap & Glory eyeliner too!